Spokespeople. Brand advocates. Experts. Sponsors. Thought Leaders. Influencers. Call them what you will, but leveraging the voices, expertise, appeal, and reach of influential people has been a standard marketing and advertising practice for at least a century. In the B2C realm, that is. So, how do we reconcile the different worlds these statistical snapshots create? From my perspective, it all comes down to perceived value. B2B marketers, who have the difficult task of nurturing buyers through a long and winding sales cycle, want to ensure that a traditionally B2C tactic can drive the kind of results they need and want. In a digital landscape that’s bursting with content, bubbling with consumer distrust, and growing demand for personalization—influencer collaborations offer enormous value and benefits. But don’t just take my word for it; take it from influencer marketing leaders at a range of B2B brands. Benefit #1: Influencers help you build a narrative of trust. From security scandals and privacy concerns to consumers’ dwindling confidence in the world’s core institutions, consumer trust is on the downslide. That general distrust coupled with an historical skepticism of marketing and advertising messages makes it imperative that B2B marketers work to build genuine trust and credibility with buyers and prospects. When you co-create content with influencers, you not only provide influential experts with a medium to share valuable insights, but can also provide your audience with a mix of perspectives—upping your storytelling capabilities and credibility. Read our full interview with Whitney. Benefit #2: Influencers bring a human element to your brand. With low consumer trust and competition forever increasing, authenticity can be one of the biggest differentiators for brands. At the end of the day, your B2B buyers are consumers who are looking for partners that understand them and that they can feel comfortable with. Influencers can help you do through the content you create together. “The main benefit is that influencers humanize a brand and capture the personality behind the logo,” Rani Mani, Head of Social Influencer Enablement at Adobe, says. “Additionally, influencers raise brand awareness and engagement by giving companies access to an audience they may not otherwise have through a trusted and credible source. Read our full interview with Rani. Benefit #3: Influencers help you garner relevant reach. The modern digital landscape is not only overloaded with content and simmering with distrust, but demand for personalization and relevance is increasing. But influencers provide a way to overcome these obstacles and capture new content opportunities. And Martin Jones, Senior Marketing Manager of Business Social Media, Content Marketing, & Employee Advocacy, at Cox Communications, is right there with her. Read our full interviews with Lucy and Martin. Benefit #4: Influencers help you keep a pulse on audience needs and pain points. Deep audience knowledge is part of the foundation of your marketing strategy. Beyond demographics, you need to understand their needs, pain points, motivations, and how and where they search for answers. What better way to collect qualitative, near real-time intel than engaging and collaborating with an industry expert on a regular basis? Read our full interview with Konnie. You heard it from the experts. B2B influencer collaborations can help you create content that builds trust and credibility with your audience, humanize your brand, overcome ad and algorithm barriers to garner targeted reach, and keep your finger on the pulse of your audience. The bottom line? For any kind of content a business creates and releases to the world, there is an opportunity for collaboration with credible voices that have active networks interested in what those voices have to say. We have no shortage of strategic tips, tactical tricks, and amazing insights on influencer marketing. Take some time to peruse our recent posts on the subject. 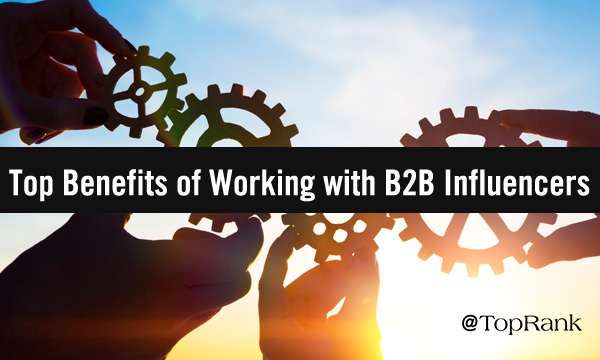 The post How Can B2B Brands Benefit from Collaborating with Influencers? Let’s Get the Scoop from the Experts appeared first on Online Marketing Blog – TopRank®.